We are often asked, "How many jumps should I start with?" You can never have too many single jumps to practice agility. A good starting place is four jumps. This is the absolute minimum number of jumps that we recommend. You can teach a variety of skills, drills, and exercises with four jumps. Four jumps will allow you to work on a short jump chute or jump grid. You can setup a "box" with your jumps and practice handling, collection, and 270 degree jumps. You can teach your dog jumping left and right. You can be outside the box and send your dog or you can handle from the inside of the box. Your jumps can be setup in a horizontal line, so that you can practice serpentines and threadles. Go the next step and get eight jumps. Now you can setup two boxes with one introductory jump. You've now multiplied your drills that you can practice with your dog. Your jump grids can be of recommended size and quantity of jumps. You can also setup your jumps in a circle with the jump bars perpendicular to the circle or on the circumference of the circle. This pattern also enables you to train a variety of skills. Your next consideration is a double jump and a triple jump. You could set two or three single jumps together to make your expanded jump, but having double and triple jump in your course work is really valuable to practice. We've seen many dogs run a clean course and the last obstacle is a triple and the dog is not prepared for it, and bang, down comes the bar. You can really be ahead of the pack and have two sets of eight jumps. This is the ultimate in training because you can keep a jump grip up at all times that is separate from your course work, and have eight single jumps to have for course work. And when you include your double and triple, you can really practice all the jumping skills and drills necessary to get you those "Qs". 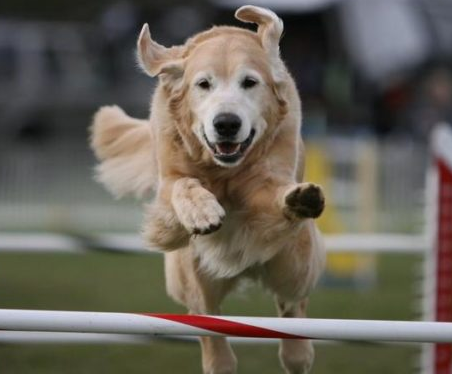 0 Response to "4 to 8 Dog Agility Jumps Makes Ideal Training"